Growing wild in tropical North eastern Brazil, the babassu is a tall, feathery palm bearing bunches of up to 600 nuts. When these nuts fall to the ground, they are collected in baskets by women known as ‘babassu breakers’ who crack open the very hard shells with axes and wooden clubs and extract the kernels inside to produce Babassu Oil. The palm is considered to be one of the most productive oil crops in the world. It fruits after about 7 years and reaches its peak between 35 and 40 years. In a year, one Babassu palm can produce up to 2000 fruits. The light brown fruit are covered with a tough fibrous exocarp surrounding a grey mesocarp containing three to six oil bearing seeds. Babassu Oil, also known as babassu wax, babassu butter and cusi oil, is light yellow when liquid and creamy white when solid. It is very similar to Coconut Oil except that it has very little odour and is a soft solid, more fluffy and buttery than the much firmer coconut oil. It is increasingly being used to replace coconut oil in many products like food, soap and cosmetics. Like the coconut palm, the Babassu palm is a multipurpose tree and for centuries different parts have been used to make fuel, food like flour and oil, building materials and mats. The Babassu trade supports more than 2 million rural Brazilians and in some regions the nuts are a form of currency. Babassu Oil contains five acids: lauric (50%) myristic (20%) palmitic (11%) oleic (10%) and stearic (3.5%) as well as vitamin E and phytosterols. Babassu Oil is an excellent all-round moisturiser for dry or oily skins. It may be a better choice than Coconut Oil for acne because it is non-comedogenic. Benefits include reduced redness, soothed itchiness and because it is a light but penetrating oil, it doesn’t leave a greasy film. It nourishes hair and skin, being protective, cleansing and anti-inflammatory. It also helps with skin turnover as the naturally occurring plant sterols help renew skin cells. Babassu Oil melts on contact with the skin and the transference of heat outwards has a cooling effect on the skin, which is good for dry, parched skin and inflammatory conditions. The high lauric acid in Babassu Oil confers many of the same advantages as coconut oil. Lauric acid is a good source of energy and gets converted to monolaurin either on or in the body. It provides antifungal, antiviral and antimicrobial protection. The myristic acid is anti-inflammatory and the palmitic acid can help nourish and protect the hair. Refined Babassu Oil is used by the cosmetic industry in the production of moisturisers, soaps, creams, hair and body products and lipsticks. The lauric and myristic acids help to produce a cleansing, fluffy lather in cleansing solutions. It is a non-drying oil used in food in baking, sweets and icing. It is also used in medicine and for industrial purposes. 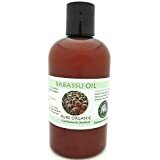 Babassu is a healthy alternative to refined vegetable oils for cooking and is suitable for adding to shampoo or as a neat application to skin (even for babies,) hair and scalp and as a hot oil treatment.